Police Scotland has announced women from Muslim communities may now wear the hijab as part of their uniform. 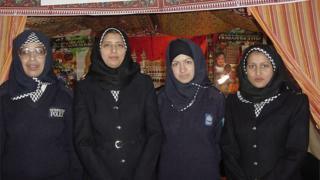 It is part of an attempt to encourage Muslim women to consider pursing a career in the force. Officers and police staff have always had the option to wear religious headwear but the announcement ratifies the use of the hijab. Chief Constable Phil Gormley said the police force should be representative of the communities it serves. The move comes 10 years after the Metropolitan Police in London approved a uniform hijab. Mr Gormley said: "I hope that this addition to our uniform options will contribute to making our staff mix more diverse and adds to the life skills, experiences and personal qualities that our officers and staff bring to policing the communities of Scotland." The announcement was welcomed by the Scottish Police Muslim Association's chairman Fahad Bashir. He said: "This is a positive step in the right direction, and I am delighted that Police Scotland is taking productive steps in order to ensure that our organisation is seen to be inclusive and represents the diverse communities that we serve across Scotland. "No doubt this will encourage more women from Muslim and minority ethnic backgrounds to join Police Scotland." There are currently six female Muslim officers working for Police Scotland - but none of them wear the hijab either on duty or outwith the force. The most recent figure for the overall strength of the force - released at the end of June - was 17,242. Official figures showed that there were 127 applications from black, Asian and ethnic minority candidates in 2015-16. That was just 2.6% of the total number applying to work for the force. In order to reflect the 4% figure across Scottish society, the force said it would need to recruit an additional 650 ethnic minority candidates.